Iran’s Supreme Leader Ayatollah Ali Khamenei spoke during a meeting in Tehran Monday saying that average Iranians have not seen any benefit from the nuclear deal with world powers. 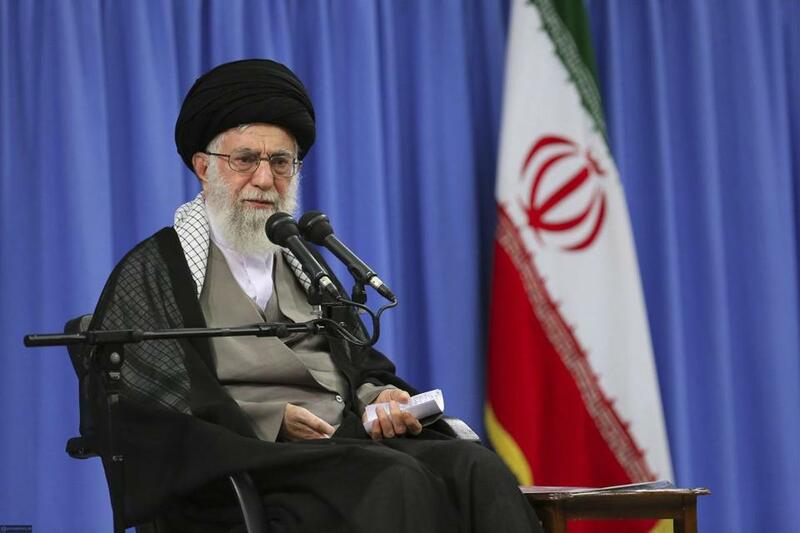 TEHRAN — Iran’s Supreme Leader Ayatollah Ali Khamenei said Monday that the Iranian people have not seen any benefit from the nuclear deal with world powers, state media reported. Khamenei, who has final say on all state matters, said the United States has continued to thwart Iran’s economic relations with other countries despite the landmark accord. He said Tehran will refuse to engage in any further talks with Washington due to what he described as US violations of the deal, though he has previously ruled out further negotiations in other speeches. ‘‘They tell us ‘Let’s talk about regional issues, too.’ But the experience of the nuclear deal suggests this is deadly poison and in no way can the Americans be trusted,’’ Khamenei was quoted as saying. The head of the UN nuclear agency says Iran appears to be hewing to the letter of last year’s agreement. ‘‘Negotiation with such a government means diversion from the correct path of advancement of the country, giving constant concessions and allowing a bullying policy in practice,’’ he said. The deal, which went into effect in January, limited Iran’s nuclear program in return for lifting some sanctions. Iran has repeatedly complained that it has fulfilled its end of the deal while all the agreed-upon sanctions have not yet been lifted. Tehran is still struggling to attract large-scale foreign investment and many multinational companies remain fearful of US prosecution or fines for doing business with Iran. The US government still maintains some of its own sanctions against doing business with Iran that are outside the scope of last year’s deal. The US-based company Boeing Co. signed a deal with Tehran involving dozens of planes and worth as much as $25 billion. But the agreement has been criticized by both Republican and Democratic politicians. In July the House passed two measures that would block the sale, but the issue has not yet reached the Senate. Khamenei also described a rare recent visit to Israel by a delegation of Saudi nationals as ‘‘treason’’ to Islamic nations while adding that the United States was behind the visit. The group, including former Saudi military general Anwar Eshki, visited Israel in July, and Eshki met with a senior Israeli Foreign Ministry official and a group of Knesset members. Saudi Arabia distanced itself from the visit, saying it did not reflect the views of the Saudi government. Rival Iran and Saudi Arabia have had no diplomatic relations since January and support opposite sides in conflicts in Syria and Yemen.